In many parts of Virginia, construction is picking up. While activity remains below prerecession levels, projects are going up in all of the state’s major markets. General contractors are getting work across multiple sectors, but they still report challenges, namely finding enough skilled workers and paying for rising health-care costs. Still, the mood is more optimistic than it has been in years. The multifamily sector has been particularly hot with new apartments under construction in downtown and suburban Richmond, downtown Roanoke and in Northern Virginia around the expanding Silver Line Metro. Young professionals are fueling the trend as they opt to live near their workplace or public transportation routes that can take them to their jobs. Another busy sector is health care. Several hospitals are financing expansions, and medical centers and emergency rooms are popping up as co-anchors in mixed-use projects. One example in Henrico/Goochland County is The Notch at West Creek, a 230-acre mixed-use project. The Lingerfelt Cos. broke ground on the first of three 60,000-square-foot medical office buildings, and a large apartment community is under construction as well. Builders also are finding opportunities in higher education and hotels. Blackburg’s Virginia Tech recently completed a 147,000-square-foot performing arts center. In Richmond, the five-diamond Jefferson Hotel is upgrading guest rooms, while Virginia Beach has joined forces with developer Bruce Thompson on a $260 million renovation of the iconic Cavalier Hotel and its sister hotel. On the office side, the market has been sluggish, with one exception: Tysons Corner. 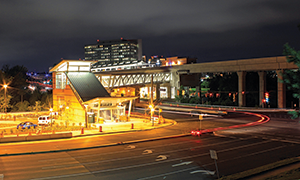 The state’s largest business and retail center is transforming into a more urban community as it readies for expansion of the Silver Line Metro. Four new stations are scheduled to open this year, which has sparked more than 45 million square feet in new development, which will nearly double the size of Tysons. According to research from Cushman & Wakefield, nearly 4 million square feet already is under construction. Several of those projects are office towers. This pipeline of new construction has been a welcome development in the face of cutbacks in leasing and construction from the federal government, which typically gives Northern Virginia a boost. In the public sector, the construction industry expects new work in transportation. A funding bill passed last year is expected to pump more than $4 billion into Virginia’s transportation plan over the next six years.